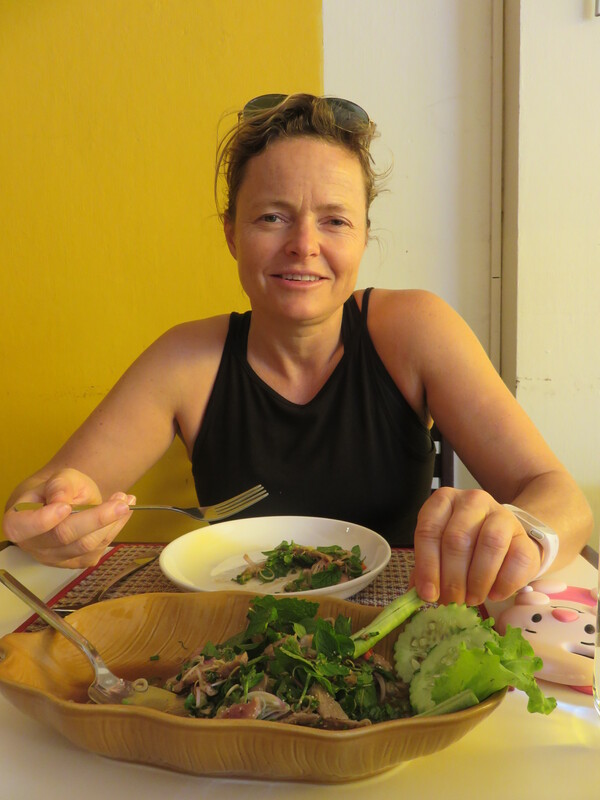 Another day in Vientiane starts with a happy Katja. With yogurt and muesli for breakfast she’s ready for anything. The coffee at the hotel is nothing to brag about. It’s closer to the Vietnamese coffee than anything else, and in all honesty-we’ve had better coffee than that. First stop of the day is therefore a coffee place. With coffee to go we move towards the bus station. We’re heading towards the Buddha park and we’ll go by the local bus. What!?! Did you take pictures of this? We’ve googled the park and it’s an attraction that seems to be right up our alley. Large Buddha’s on a small area. It’s built by an artist/monk and it’s a blend of both Buddhist and Hindu figures there. Tripadvisor has a very varied assets of reviews, so this is definitely something that you like our you don’t. We asked yesterday about the price for hiring a tuk-tuk to take us there. He started out on three hundred thousand, and we would’ve had a hard time getting that down to a hundred which we could accepted. A quick check shows there’s a bus going from the center that stops directly outside the park. It costs six thousand per person each way, a total of twenty four thousand round trip, and it runs every fifteen minutes. We find both the bus station and the bus easy enough. If you ever do the same remember to read the bus number on the sign in the front window not on the side of the bus. We were the only tourists on the bus, but even though it was full the air was surprisingly good onboard. There is no smoking in restaurants, buses and almost everywhere else that’s indoor and that makes a world of difference of course. When the bus finally stops at the park after fifty minutes it’s only three passengers left and the driver speaks a lot to us in Laotian. We wave and say thank you, hopefully that’s the correct answer. The park is super cool! It starts with a pumpkin like structure that is large enough to climb into and that has three stories with sculptures inside before you emerge on the roof. The “doors” and stairs are built for a small Asian guy. I mean that literally. Not a normal Asian, but a small one. Getting my huge frame through these holes made for a lot of laughter and snickering. Outside on the roof we got a great view of the park. It’s bit large, but filled with different statues. Some of them are so large it’s ridiculous. We get hailed by some young local Laotians. They have a extra project in school and need to practice their English. So we’re questioned and answer as best we can. When we’re asked about what we think of the Laos people Katja says: “Very nice, but shy.” This result in a giggle of epic dimensions with a lot of Laotian being spoken. As they regain their composure they all agree, they’re shy. Back down on the ground we walk among the sculptures and enjoy the sights. Some are really beautiful, others clearly fusion between Hindu and Buddhist. We take lots of pictures and when finished step out the gate to look for the bus. We don’t wait more than five minutes before the bus arrives. This is working our very well. Katja sleeps a little while I read on the way back. 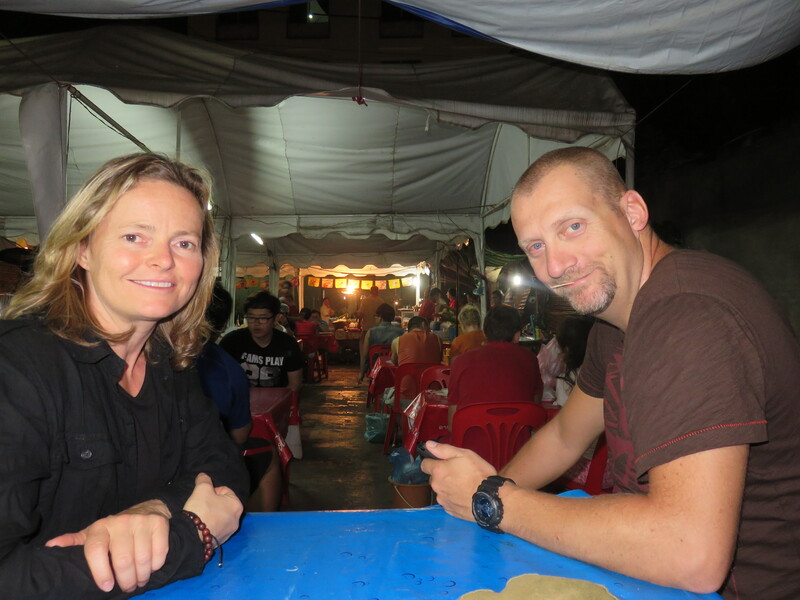 We get off a little before the main bus station and head towards the hotel and a restaurant we’ve seen there called Lao Kitchen. Lao Kitchen turn out to be a nice place with loads on the menu. We order different dishes and relax, waiting to get served. When served the food is brilliant. Spicy, tasteful and filling. I had to get another banana shake to fight off the chili. We went back to the hotel, just around the corner, to hear if they can arrange bus ticket. Apparently they’re the only once working in a hotel in Vientiane that can’t. So instead we work on another project: Kogaliving.com. It’s blog for Katja to post whatever she finds that inspires her for interior, design, funny things etc. 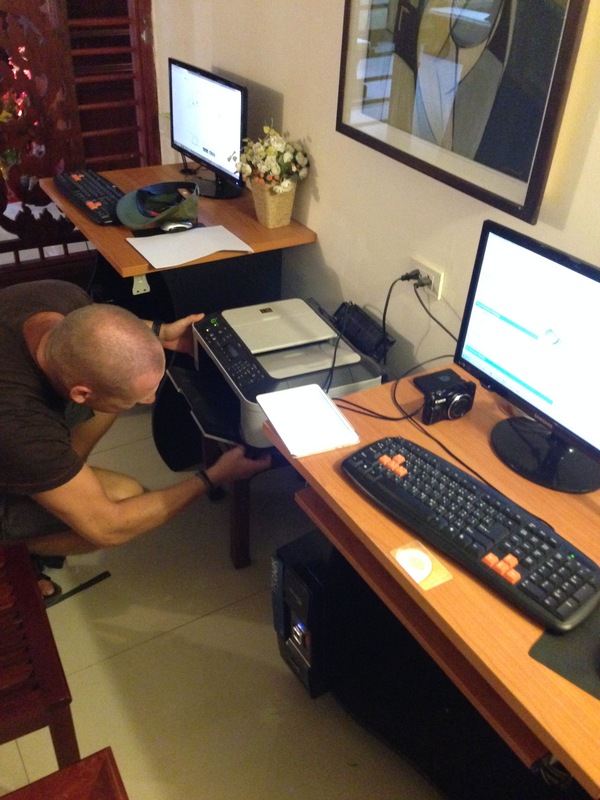 We use the computer at the hotel, but first it needs at little fixing. We walk out to get tickets and find a lady sitting just around the corner on the next street. She happily sells us tickets and there we are. Good and ready for departure to Vang Vieng. We make ready and go out again for the walk in the streets of the old town. It’s closed for traffic today as well, so we go out and find a place to eat. We pass by a restaurant that looks cheap, but has loads of people inside. Inside and inside, but at least it’s under a plastic roof. We enter and get a table normaly used to store ingredients for the bar. 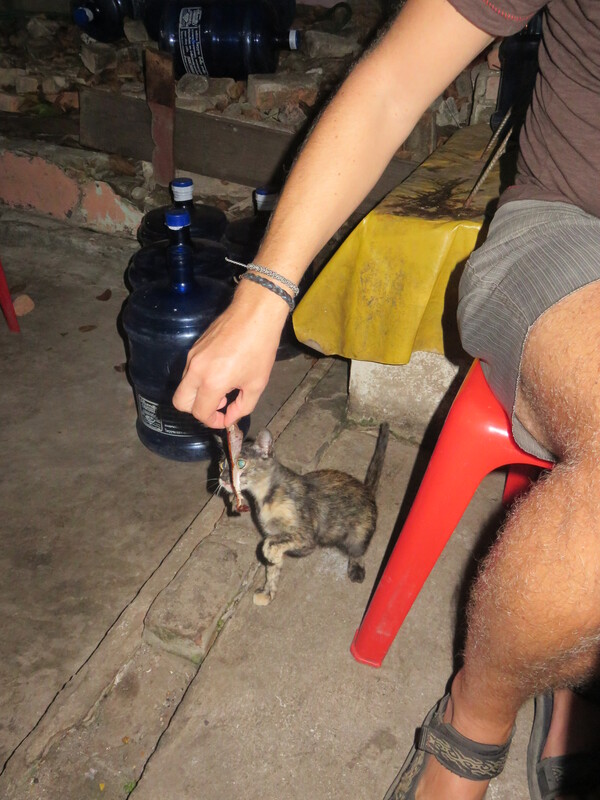 The food is good, but nothing compared to the entertainment the little cat gives us. We walk around in the old quarter and just look and enjoy the atmosphere. There are performance artists around to day also. Dancing, painting and more. We also saw a demonstration of Lao Boxing. Close to what we normally would call Thai boxing. There are big arguments whether it originated here in Laos or in Thailand. Guess you can easily figure out who carries which arguement. See the red samurai in the middle? Quite happy with the day we call it a night and walk back to the hotel. It’s been a few really good days here in Vientiane. It’s a city it’s easy to like. Hopefully Vang Vieng will carry the torch even further.